The Alpine Fault is a ~900 km-long, active Australian-Pacific plate boundary structure, which accommodates up to 70–90% of total plate boundary motion across the South Island of New Zealand. Despite abundant evidence that large to great (~M 8) magnitude earthquakes have occurred frequently and regularly on the fault in the past, it has not ruptured historically and is thought to pose one of the greatest seismic hazards to the country of New Zealand at present. This study adopts a multi-disciplinary field-based approach to examine fault zone structure and mechanics, spatio-temporal variations in fault behavior, and geomorphic evidence of key coseismic hazards on the central and southern Alpine Fault. The first three complete sections through the fault core of the southern Alpine Fault show that modern slip is localized to a single 1 to 12 m-thick fault core composed of impermeable (k = 10<sup>-20</sup> to 10<sup>-22</sup> m<sup>2</sup>), frictionally weak (μ<sub>ss</sub> = 0.12–0.37), velocity-strengthening, illite-chlorite and saponite-chlorite-lizardite fault gouges. The frictionally-weakest fault gouge occurs in the widest fault core and is spatially associated with a newly-identified serpentinite-bearing tectonic mélange. In contrast to the relatively straight and localized dextral>normal-motion fault traces of the southern Alpine Fault, the central Alpine Fault is characterized by non-optimally-oriented oblique dextral-reverse motion, which causes the fault zone to partition in the upper ~1–2 km. Utilizing airborne light detection and ranging (LiDAR) data, the surface expression of a portion of the central Alpine Fault was mapped in unprecedented detail to confirm previous mapping that shows the fault is composed of serially-partitioned (i.e., sequenced) oblique-thrust and strike-slip faults at 1–10 km-length scales, and introduce for the first time the widespread occurrence of ~300 m-wide parallel-partitioned positive flower structures. A fault kinematic analysis predicts the fault trace orientations observed and supports the concept that the partitioning behavior is scale dependent, with different mechanisms (i.e., crustal-scale discontinuities, thermal weakening, fluvial incision, sediment interaction) exerting control at different scales (< 10<sup>6</sup>–10<sup>0</sup> m). A slip stability analysis suggests that the newly-formed shallowly-rooted faults are kinematically stable, and thus the existing ~300 m-wide zone of fault traces defines a surface rupture hazard zone where future ruptures are expected to occur. Deep-seated, long runout, catastrophic rock avalanches currently represent an underappreciated hazard of Alpine Fault earthquakes. The previously undescribed ~0.75 km<sup>3</sup> c. 660 AD Cascade rock avalanche has an unambiguous structural relationship to pre-existing deep-seated bedrock failures. In comparison with other documented rock avalanches in the Southern Alps and Fiordland, it provides clues about precursory conditions for large catastrophic failures and suggests a mass above Franz Josef (town) poses a considerable risk. A remarkable ~8 km dextral offset of major valleys and glacial deposits is recorded along ~100 km of the southern Alpine Fault. Tight age constraints allow correlation of this event to the Waimaunga Glaciation (Marine Isotope Stage 8; c. 270 ka) and indicate a dextral Alpine Fault slip-rate of 29.6 (-2.1/+2.3) mm/yr. Ages of marine sediments uplifted to ~600 m elevation yield fault-proximal Australian plate uplift rates of ~2.2–2.5 mm/yr. A re-assessment of the slip-rate and uplift rate catalog for the southern Alpine Fault suggests relatively constant rates over the last > 300 kyrs, and potentially > 3.5 Myrs. Together, the results of this study frame a view of the southern half of the Alpine Fault as a highly-localized, long-lived, very weak locus of plate boundary motion that has had relatively constant spatio-temporal displacement rates in the latter part of its history, ruptures in hazardous large magnitude earthquakes with strong peak ground accelerations, and exerts a first-order control on landscape evolution of the South Island. 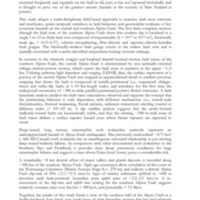 Barth, Nicolas Christoph, “A Tectono-Geomorphic Study of the Alpine Fault, New Zealand,” Otago Geology Theses, accessed April 22, 2019, http://theses.otagogeology.org.nz/items/show/557.